← Where can I go 4 custom stationery inspired by South Asian designs? It is here! ‘Tie the Knot Bazaar’ will take place tomorrow, November 8th. After weeks of preparation, ‘Tie the Knot Bazaar’ is less than 48 hours away and we at tanaRi events’ can’t wait to see everyone! 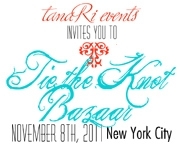 tanaRi events’ will host the first annual ‘Tie the Knot Bazaar’ at Soigne K in New York City on November 8, 2011. The event will feature top wedding professionals from the world of fashion & accessories, photography, custom stationery, hair & makeup, fine dining and entertainment in New York City. The guests will be entertained with dance performances by Eastern Dance Group, delectable appetizers and drinks by Tulsi NYC and desserts from Bittersweet NYC. They will also have the opportunity to learn how to drape a sari and receive a free makeover by the talented artists from Damali NYC. We know that most of you have it on your calendar and we love all you organized peeps! 😉 Those who pre-registered will be eligible to win prizes and giveaways. A few lucky guests will have the opportunity to win a designer shawl from Soigne K or a Chef’s special five-course tasting menu with wine pairing from Tulsi NYC and other prizes. Pre-register for the Tie the Knot Bazaar online by sending an email to rsvp@tanarievents.com and qualify to win prizes. Thanks to our vendor partners Chef Hemant Mathur from Tulsi, Reena Vadehra & Jaee Likhite from 3 Bees Paperie, Surbhi Sahni from Bittersweet NYC, Tina Doshi from KSD Weddings, Heidi Evora- Santiago from Damali NYC, Soigne Kothari from Soigne K, and Jayesh Rana from Raaz Entertainment for joining us in this effort to bring the best for tanaRi’s friends and supporters. If you have questions, feel free to contact us at info@tanarievents.com or 917-628-0273. See you tomorrow!